The first man to win the Gift from scratch. From Madagascar, Ravelo proved everyone wrong when in 1975 in wet conditions he scorched the120 metres in 12 seconds, ahead of P. Marks and M.J. McGregor. Ravelo’s win at Stawell reads like a fairy tale. He arrived in Australia from America in peak condition just two days prior to the Stawell carnival. After winning his heat in 12 seconds, experts still did not give him a chance of taking out the Gift. Ravelo’s main contender, Warren Edmonson was run out in the semis, leaving Marks as favourite. Rain lashed Central Park on Monday, but Ravelo could be seen in his yellow track suit, jogging around the oval. He shot out of the blocks in the final, chasing runners 6.5 and 7.25 metres in front. He was a metre behind with about 12 to go, and he suddenly flashed passed to win. It was a fantastic win, a feat never accomplished before, and not equaled until Joshua Ross won from scratch in 2005. 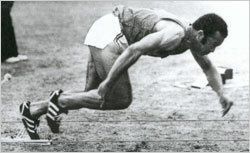 Invited to compete in the CUB World Championships, held at Central Park in 1975, Ravelo took out the 60 metres, 100 metres, second in the 120 metres , and was third in the 200 metres. Unfortunately Ravelo’s appearance at Stawell was to be his first and last.